The Castle Hotel, once a Norman fortress, is steeped in the drama and romance of English history. In 1685, the Duke of Monmouth's officers were heard 'roistering at the Castle Inn' before they were defeated by the forces of King James II. Today, the Castle lives at peace with its turbulent past, but preserves an atmosphere of ancient tradition. 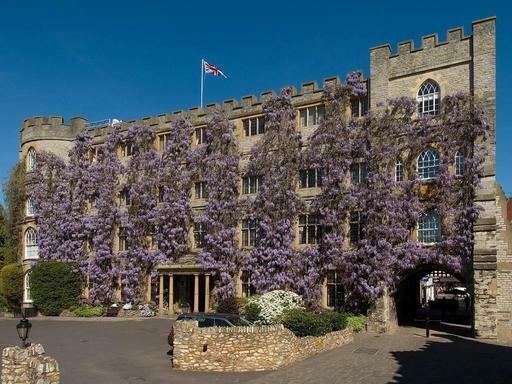 The Chapman family have been running the hotel in somerset for over 60 years, and in that time it has acquired a worldwide reputation for the warmth of its hospitality. The stylish Castle Bow Restaurant is very much THE place to dine in the area. Head Chef Liam Finnegan sources the finest ingredients of the region, including fish from Brixham market, meat from MC Kelly in Crediton, dairy from Longman's in Yeovil, a variety of artisanal cheeses, plus fresh herbs direct from the garden. Located in the heart of Somerset, The Castle is the ideal base for exploring a region rich in history. This is the land of King Arthur, King Alfred, Lorna Doone's Exmoor, the monastic foundations of Glastonbury and Wells, Roman and Regency Bath, Longleat House and the majestic gardens of Stourhead and Hestercombe. All this and much more can be discovered within easy driving distance of Taunton.